At least on an annual basis your church leadership needs to take some time away to consider how you are doing in reaching your mission. Many churches have found that the SWOT analysis is a helpful tool for evaluating their organizational progress. 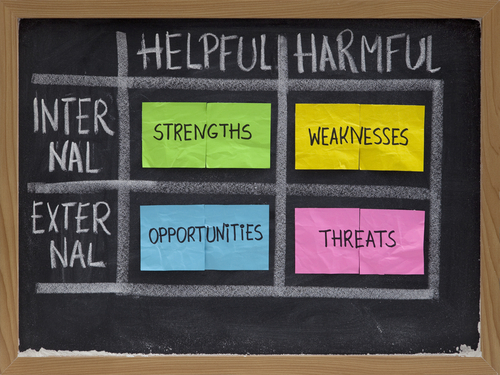 SWOT is an acronym for Strengths, Weaknesses, Opportunities and Threats. The goal of this time together is to examine internal (Strengths & Weaknesses) and external (Opportunities and Threats) elements of your church. You can use this exercise for the church as a whole or for specific ministry areas. Pull together a diverse group of trusted leaders from your church. Try to avoid having just the “usual suspects” in the room. Pick a room with enough space for people to wander around a bit … don’t cram everyone into that tiny spot in the basement! Have some snacks available … that indicates to people that this is going to be an informal time. Post four different sheets up on the wall … each with one of the titles on it. Explain that together you’re going to brainstorm each area to understand more about the church. At first you’re brainstorming … no idea is a bad idea! Once you’ve “exhausted” each area … move onto the next one. Use the questions below to help prompt conversation. After you have lots of feedback for each area … loop back to each area and look for consensus on which responses are the “most relevant” for your church at this time. What unique advantages does your church have? What have you been able to do repeatedly that others struggle with? Why do you people drive past other churches to come to your church? What do your people tell their friends they like about your church? What do your people tell you that you need to change about your church? Why have people left your church to go to other churches? What trends you see in your community that you could leverage for your church? What is no-one doing to reaching people that should be tried? What other ministries or organizations could you partner with for more effectiveness? What obstacles do you face in your mission right now? What’s happening in your culture that might cause you problems in the future and how? What’s going on in your community that might cause difficulties for you?